Winston Workstation™ - Energizing your body. Inspiring your mind. Instantly converts any desk into a sit stand workspace boosting health and productivity. Recent studies have shown that sitting throughout the day can have the same negative health consequences as smoking. Winston seamlessly integrates into your workday for a boost in health and wellness. Winston Workstation now comes with a compact work surface, ideal for users with smaller spaces who want to take advantage of a healthy sit stand workstation. For optimal performance, select the model that will support the total weight of your monitors and all items that will be placed on the Winston work surface. Note: pricing on this series is on a net price basis and subject to change without notice, no EA discounts, incentives, freight or other programs will apply. Please contact your local EA dealer, rep or EA customer service for more details. The Winston Workstation's adjustable upright is available in your choice of black, silver and white. 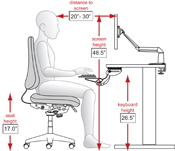 Designed to accommodate standing work without the distraction of unwanted movement. Quick and easy monitor installation. Take the work out of adjusting and replacing monitors. Choice of work surface size plus a convenient storage tray allow you to bring all necessities with you when you stand. Retrofit your existing desk into a healthy workspace with two easy mounting options: freestanding or desk clamp. Features a 17" range of vertical height adjustment and a locking cylinder to keep the workstation in place. Winston is assembled in the USA using components created through a green manufacturing process.